Latest Attack On Mogadishu Ends With At Least 23 Dead : The Two-Way Al-Shabab claimed the attack as it wages a bloody insurgency in Somalia's capital. A mother and her three children, one of them a baby, were among those killed according to police. Somali soldiers inspect the wreckage of vehicles after an attack claimed by al-Shabab left at least 23 dead in Mogadishu on Saturday. Among the dead: a mother and her three children, one of them a baby, say Somali police. The victims also include at least a dozen police officers, reports Reuters. Five militants stormed the building Saturday after a suicide truck bomber lingered at the gate, pretending to repair the vehicle before it blew up, reports The Associated Press. Once inside the Nasa-Hablod hotel, the attackers engaged security forces in a gun battle, with at least one militant detonating a suicide vest. Police say three attackers are dead and AP reports five have been captured alive. The police and intelligence chiefs have been fired in the wake of two brutal back-to-back attacks on the Somali capital, according to the wire service. Saturday's siege comes just two weeks after the deadliest attack ever in the country. 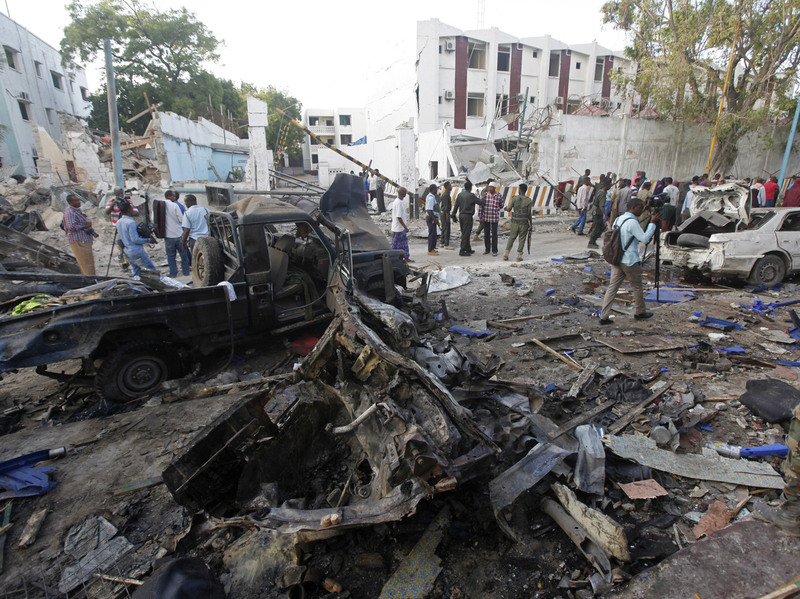 On Oct. 14, twin bombings in Mogadishu took a staggering toll; more than 350 killed. 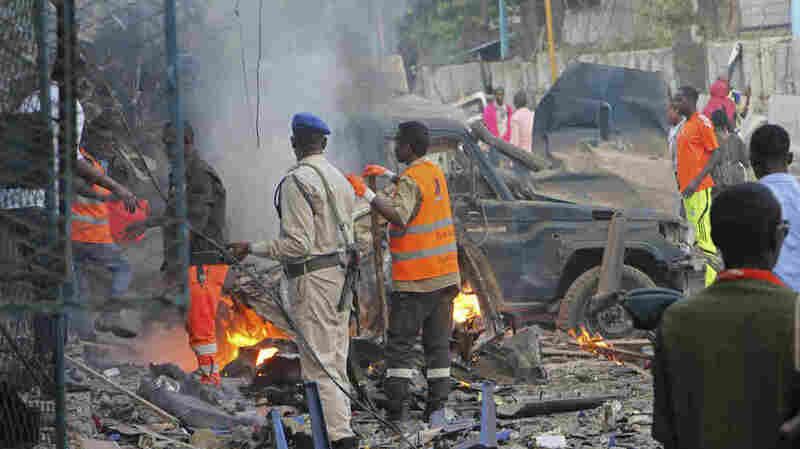 Nobody has laid claim to that attack, although the Somali government blames al-Shabab, a group the United States has designated a foreign terrorist organization. Mogadishu has been a frequent target of al-Shabab attacks as the group fights to overthrow the U.N.-backed government and seeks "the creation of a fundamentalist Islamic state in Somalia," according to the Council on Foreign Relations, a Washington-based think tank. In June the group performed a similar overnight siege at a pizza restaurant and nearby hotel that left dozens dead. It too began with a car bombing at the hotel's front gates. Rescue workers survey the devastation on Sunday after a vehicle bomb was detonated outside a hotel the night before. Al-Shabab has also launched more than 150 attacks in neighboring Kenya; among the deadliest were a 2015 assault on a university in Garissa that killed around 150 people and an attack on a Nairobi shopping mall in 2013 that left dozens dead. There are thought to be up to 9,000 al-Shabab fighters in Somalia today, says CFR. Born in 2006, the al-Qaeda-affiliated group reached its peak in 2011, reigning over parts of Mogadishu, until African Union troops helped drive it out. Today the group controls parts of Somalia's rural southern and central regions, says CFR. NPR's East Africa correspondent Eyder Peralta has reported that Somalia will likely seek deeper involvement from the United States as it works to flush out the al-Shabab from its strongholds. After the Oct. 14 attack, the United States did step up its military response, reports AP, launching a drone strike against the group about 35 miles outside Mogadishu. And Somali Armed Forces along with African Union troops are readying a major offensive against the militants, reports Voice of America. Somali citizen Mohamed Muse tells VOA he has witnessed thousands of troops assembling. "We have seen unusual government military buildup. We have witnessed trucks carrying military supplies, technical vehicles mounted with heavy machine-guns."